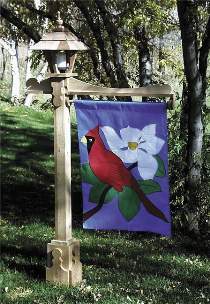 Cedar lamp post has lift out bar so you can easily change banners for any occasion. Designed to be used with Malibu low voltage landscape lighting. Additional lamp tops can be made to house remaining lower to the ground lights. Order 1219 wood finial separately. Measures 81"H.